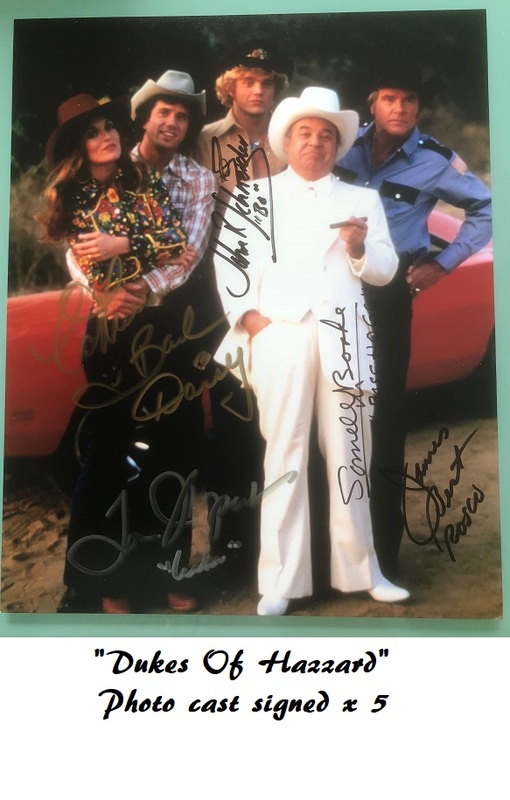 A rare promotional photo of the televison series "Dukes Of Hazzard", with an impressive collection of signatures ! The Duke cousins (Bo and Luke) were known for spectacular car chases and stunts, especially high jumps, in almost every episode. " YEEEEE - HAH !!!" Sadly Sorrell Booke, and James Best are no longer with us. Very rare item ! We also have a rare fully cast signed Duke Of Hazzard 1:18 car, plus a very rare signed upper rear door panel from a screen jumped General lee. Signed by John Schneider "Bo Luke" complete with Photo of John Schneider signing.